Here's another seasonal treat from the blog of Leanne Brown, author of Good and Cheap: Eat Well on $4/Day. Wild ramps appear very briefly in early spring, making their way out of winter hibernation beneath the forest floor and stretching their delicate bright-green leaves out into the warm spring light. Enjoy this recipe now on toast, atop fresh pasta, on meat, on fish, or with your favorite vegetables! 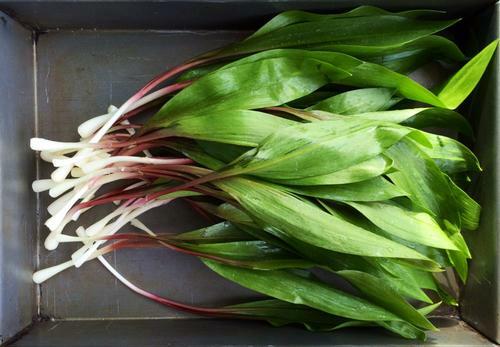 Be on the look out for these pungent beauties in your local farmers' market, or consult an expert forager or botanist to try your hand at harvesting ramps from the wild. Thoroughly clean the ramps. (They are grown deep in the dirt and usually have some serious grit.) Chop off the root ends and any particularly wilted or gnarly bits of leaf. Add the almonds and romano. Process for about a minute to break everything up. Add the olive oil a bit at a time while processing. Once the pesto is as smooth and runny as you prefer, stop adding olive oil and taste it. Add salt and pepper and taste again. Adjust anything else according to your taste, adding more romano or salt as needed. If it tastes a little flat, you can add a squeeze of lemon to brighten it up. *If you don't have a food processor, you can use a hand blender, do it by hand, or with a mortar and pestle. Use wild ramps this spring to make a knock-out pesto sauce.